Barbapapa writing paper, ladybird magnets, patterned tapes and stickers. I think I’ll have fun with these gifts! A pretty tea towel with a pattern of flowers and tea cups, and woodland magnets. My fridge is going to look wild soon! And nice tea towels always brighten up and personalise a kitchen. Another interesting tea towel, more fun patterned tape and jasmine infused dark chocolate. I’d been thinking of trying this chocolate before and now I can! It’s a surprisingly rich dessert. The mincemeat is definitely the dominant flavour, and the apple adds more in texture and sweetness than taste. Great served warm with maybe a little cream or ice cream. I followed the pattern from the same little book as the ‘bling books’ I also made as gifts. A basic cardboard template for the front, inner and fleece lining. Two stripes of elastic to hold the cables (and don’t iron elastic, it melts! So iron everything before starting – I learnt the hard way!). A short section of the template for the pocket – I adjusted the pattern here to add a zip. It’s an easy edit – I sewed the zip to the folded edge of the pocket and stitched the zip edge to hide the raw fold, then stitched the other side of the zip flat to the inner (I tried it with the zip folded over too but it becomes bulky and harder to manage). It’s then easy to sew the pieces together inside out leaving the pocket end of the tidy open, turn the cable tidy the right way out, then turn just the pocket inside out and sew up the final edge where it’s hidden. I also zig-zag stitched that edge to make it a bit neater. I found an edge stitch helped to keep the whole case flatter and neatened the edges. They fasten with poppers, I lined them up by sticking pins through the fabric then marking the points, it seems the work! Measuring the positions on the fabric didn’t work because it never quite ends up straight… And the number of poppers varied by where the poppers would fit around the seams and elastic. The recipients seemed to appreciate them. There’s a few travellers in the family so who knows where these little projects will end up! 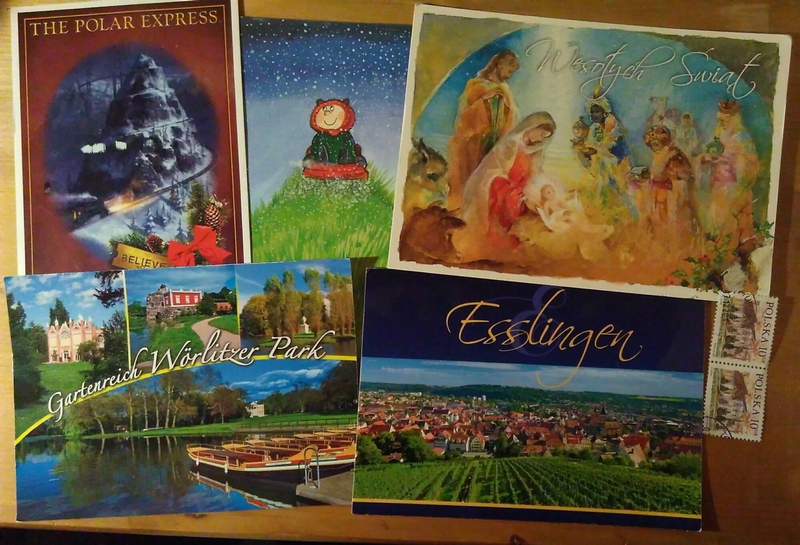 In this small collection of received cards, the Polar Express came from USA, the Postcrosser says that she works for the post office so Postcrossing is like job security! The little character in the snow is a thank you card for taking part in to Postcrossing forum Christmas gift swap. It’s an illustration by Finnish artist Virpi Pekkala. It’s been much to warm for snow here so far. A beary Christmas off to Germany for a Christmas card swap, and a village on stilts is off to Russia as part of the December postcard diary. It’s from ‘The earth from the air’, all the pictures are much more exotic than England so I don’t send them much as most people want local views! 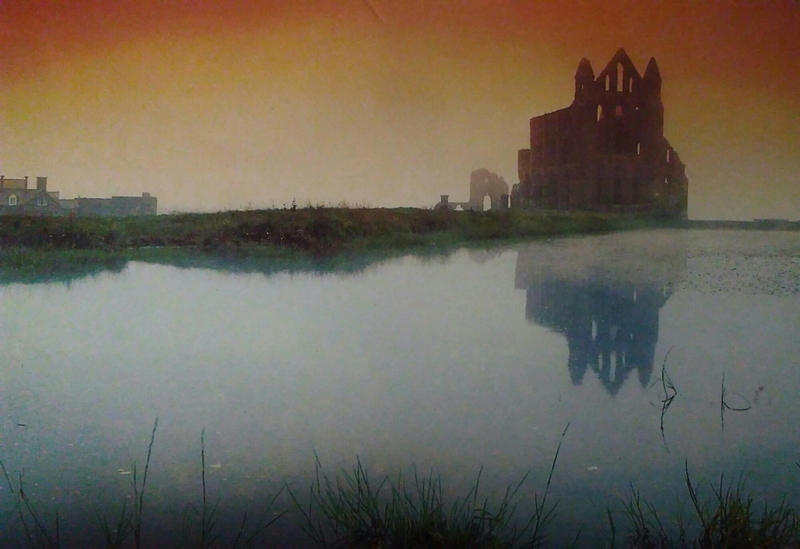 Whitby Abbey is heading for Ukraine. I hope they like the misty view with links to Dracula. I’ve just realised they stated a liking for fantasy such as werewolves and vampires and I don’t think I even mentioned the connection! Based on their favorites I thought they’d like this view. 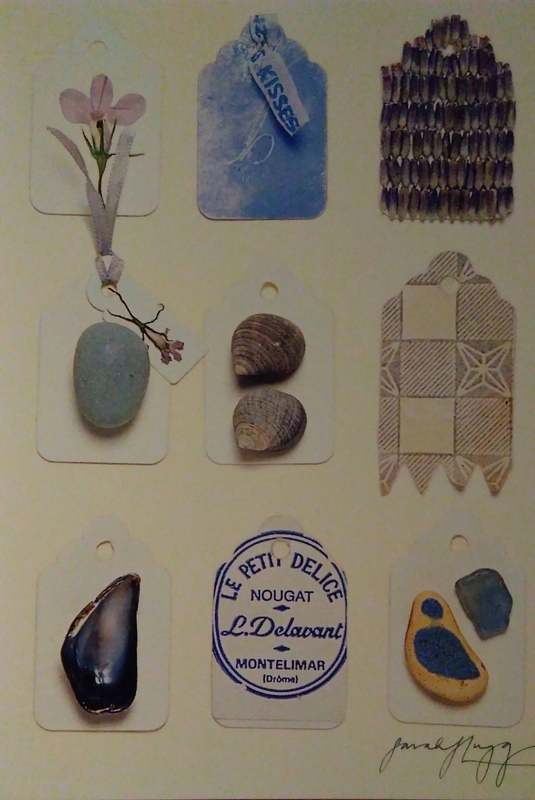 And the collection of all things blue is going to China, to a Postcrosser who likes ‘things’ such as shells and stones. Hopefully this is enough things to make them happy! All of my Christmas post! I’ve spent a fortune in the post office recently but I just love receiving letters and cards from all over the world. The swap was a choice of 2 from 5 homemade envelopes, 5 teas or 5 samples of washi tape. The swapper I sent to loved tea and envelopes so the choice was obvious! The envelopes are made from scrapbooking papers, magazines and an old calender. This swap only started travelling today but I hope they like it! I’m not usually so organised but I’ll have to send this off quickly once I get home after Christmas. Maybe I’ll stock up on Shrewsbury supplies when I’m there, or use Nottingham instead, but as I live here it seems right to send local things. I’ll admit I was disappointed in this one. The idea was to send 2 gifts corresponding to the partners initials – I sent to K.A. a book on festive Knitting and some scrap-booking Accessories which she loved receiving. I received 2 magnets – Elephants, and a Czech Spa and Shaped card. I was hoping for socks or soap or sparkle, but my fridge is looking brighter now. 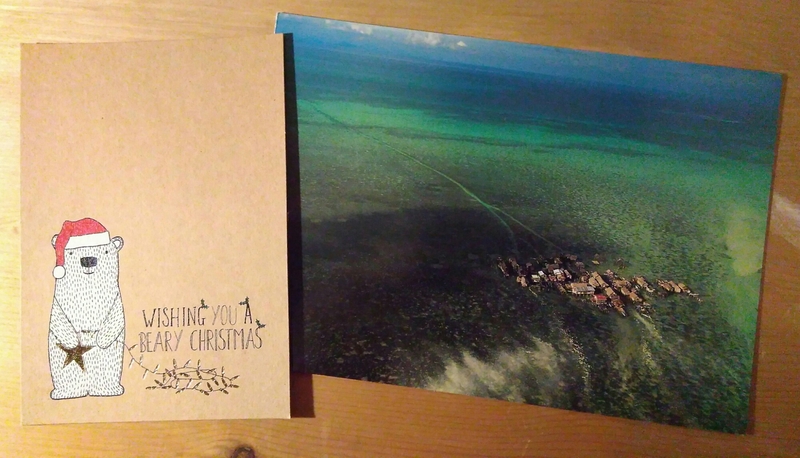 I also did a Christmas gift swap on Postcrossing. The organiser required references which gave me more confidence in this swap that most larger Postcrossing forum swaps. Sticky notes, stamps and ink pads set, and a neon plastic decoration. It’s been received but not opened yet. I realised after I sent it she asked for no note-pads but I think sticky notes are different enough. It feels exciting, I think there’s several things in there but I have no idea what! 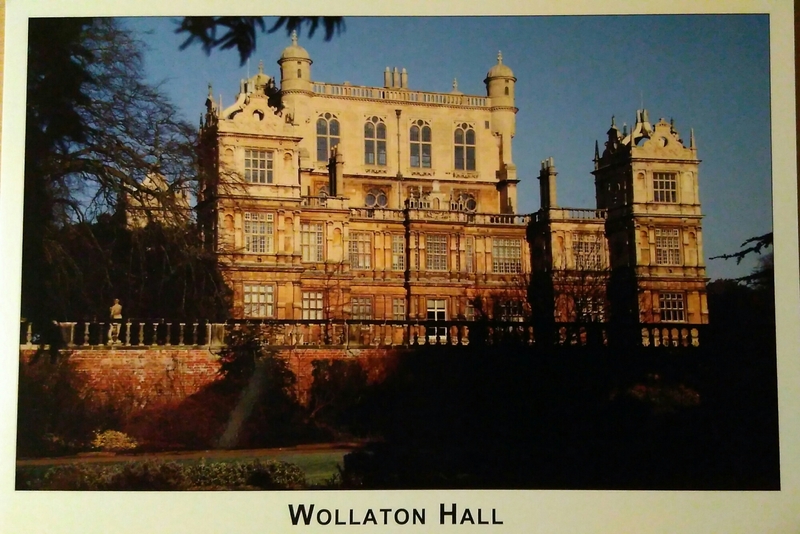 Last night I went to see Wayne Manor Wollaton Hall by night. There was a special Christmas event to see the hall by lantern light. There weren’t as many lanterns as I expected (although there’s probably not much they could do with the Natural History galleries), but I saw a few rooms I hadn’t been to before all decorated for Christmas. And just seeing the hall lit up was worth an evening out, it’s a beautiful place. We also saw a few deer lurking in the darkness, probably wondering what was going on!